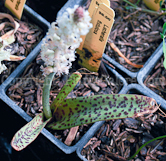 This genus of bulb plants is native to South Africa. It is named for the Swiss botanist Werner de Lachenal (1736-1800). Although a common name is Cape Cowslip, they are not related to the true cowslip, Primula veris.